This year’s show was very poorly attended and entries in all classes was well down on all previous years. No further information has been given to post on this page. This year’s Belton & Lothingland Produce & Crafts Show was held later than usual and after weeks of very pleasant weather the Sunday /was one of the worse days this autumn when it not only poured with rain but was also very windy. The gazebo loaned by the 211 Air Cadets proved very useful affording extra space in the hall which allowed for a more spacious layout and we are grateful to the Events Committee who gave us a grant towards the cost of hire of the gazebo and the children’s trophies. 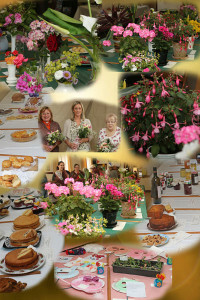 Elizabeth Myhill, the show chairperson, thanked everyone for coming, especially those who had exhibited, the friends and show committee, and all who had worked hard to make the day a success. Wendy French owner of Belton Pet & Hardware Shop presented the main prizes and the Head of Moorlands Church of England Primary Academy Mr Kevin Lee presented the Trophies and Prizes in the children’s section. The judges were Mrs. Angie Townson Baking & Preserves. Mr J English Art, Ms. D Goldspink, Crafts, Mr.R Johnson, Produce, and Mr. F Kinch, Photographs. Winners of the trophies were: Best in Show St Johns Salver: Flowers/ Pot Plants, Peter Grigsby. Myhill’s Nurseries Cup: Best Entry Roses, Bill Richmond. Fiske Cup: Best Entry Vegetables. Alan Brown. The Waveney Cup: Best Entry Fruit, Doug. Youngs. W.I. Cup: Best in Home Baking, Bella Lawrence. 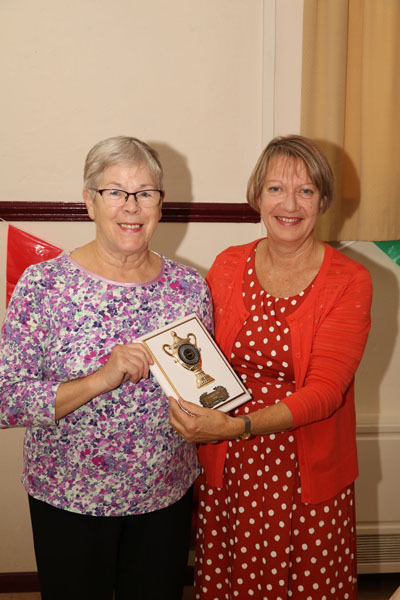 Caldicot Hall Shield: Best Entry in Jams & Preserves, Sylvia Shaw. Over 50/60’s Club Trophy: Best Entry Art, Jan Warner. Bingo Trophy: Best Entry in Crafts, Ann Sanderson Belton Photographic Shield: Best Entry Photograph, Jeff Sanderson. The Children’s Section: Village Green Sure Start Children’s Centre 4 year olds: First Roma Barker, Second Lily-Joy Leach, Third Kaylee Mush. Moorlands Church of England Primary Academy: A Symmetrical Pattern, Up to 6 years, Winner of Trophy Cup Gold with Face. Samuel O’Leary. Second: Olive Smith, Third: Evie Church. A Shape Poem 7-11years, Winner of Trophy Children’s Playful Flower: Neve Auguilere. Second: Roman, Third Libby S. and Highly Commended Isabella B. Photograph: 12-16 years, Westbury Gold Trophy Cup. Devon Williams Aged 10. Children’s Club’s. Up to 6 years. Layla Ventum (Beavers). First 7-11 years. Jessica Bland (Badgers). Second, Anna Eastwood. Certificates for FLOWERS: Vase of mixed garden flowers: First. Gloria Swan. Rose H.T. Variety: First. Bill Richmond. Rose Floribunda: First Bill Richmond. Colours of Autumn Arrangement: First Jackie Cole, Second Laurel French Shepherd, Third Gloria Swan. Flower Arrangement: First Pat Whall. Second, Heather Andrews. Third, Bill Richmond. Pot Plants: Fuchsia. First, Peter Grigsby. Flowering Pot Plant: First. Peter Grigsby. Second, Bill Richmond. Foliage Pot Plant: First Sylvia Shaw. Second, Gloria Swan. Cacti or Succulent. First Gloria Swan. Second, Doug Youngs. Pot or Basket of Flowers. First, Shirley Hume. VEGETABLES: 3 Beetroot. First, Alan Brown. 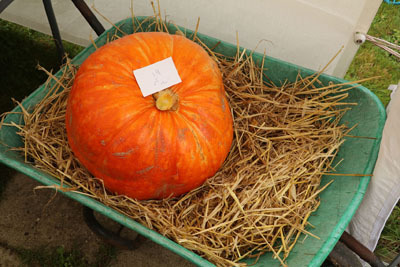 The Largest Pumpkin. First, Alan Brown. 3 Onions. First, Alan Brown, Second, Peter Grigsby, Third, Doug Youngs. 5 Tomatoes. First, Jan Pitchers, Second, Brian Swan, Third, Alan Brown. FRUIT: Dish of Raspberries. First, Alan Brown Third, Elaine White. 3 Cooking Apples. First, Olivia Daisy Burton, Third, Elaine White. 3 Pears. First, Doug Youngs, Second, Alan Brown, Third, Elaine White. HOME BAKING: Fruit Cake. First, Mrs Clarice. Victoria Sandwich. First, Shirley Hume, Second, Victoria Bracewell, Third, Han Pitchers. 5 Decorated Cup Cakes. First, Bella Laurence, Second, Heather Andrews. 5 Cheese Scones. First, Jackie Cole, Second, Shirley Hume, Third, Gloria Swan, 4 USA Style Cookies First, Gloria Swan. 1 Loaf of Home Made Bread. First, Lesley Chalmers. 7 Pieces of Home Made Coconut Ice. First, Ann Andrews, Second, Heather Andrews, Third, Victoria Bracewell. JAMS & PRESERVES: 1 Jar of Jam. First, Sylvia Shaw, Second, Heather Andrews, Third, Ann Andrews. 1 Jar of Lemon Curd. First, Ann Andrews, Second, Heather Andrews. 1 Jar of Marmalade. First, Sylvia Shaw, Second, Rosemary Bishop, Third, Ann Andrews. 1 Jar of Chutney. First, Rosemary Bishop. ART: Water Colour- Landscape. First. Jan Pitchers, Second Edward Warner, Highly Commended Hannah Crawford. Oil or Acrylic. First Jan Warner, Second Emily Cole, Third Maureen Jackman. Pastel. Maureen Jackman. Pen or Ink. First Jan Warner, Second Jan Pitchers, Third Maureen Jackman. Collage or Mixed media. First Ann Andrews, Second Edward Warner, Third Heather Andrews. HOME MADE DREW. First. Elaine White. CRAFTS. Cross Stitch or Tapestry. First Linda Hadden. Second Jean Brown. Third Lynda Bowman. Hand Knitting/Crochet First Sylvia Shaw, Second Sandy Adam Third Rosemary Bishop. Embroidery/patchwork. First Ann Sanderson, Second Jane Turner, Third Linda Bowman. A Greetings Card. First Lesley Chalmers Second Pat Whall, Third Heather Andres. Woodcraft/metalwork. First Peter Grigsby, Second Heather Andres, Third Ann Andrews. Any Craft Item. First Linda Bowman, Second Ann Andrews. PHOTOGRAPHY. Farming. First Wayne Davey, Second Jackie Cole, Third Andrew Biglin. The Broads. First Andrew Biglin, Second L Drewity, Third Bill Richmond Highly Commended Lesley Chalmers. Machinery First Robin Ives, Second L Drewitt Third Wayne Davey Highly Commended Lesley Chalmers. Beach Huts. First Wayne Davey Second D Donaldson Third L Drewitt Highly Commended Bill Richmond. Roof Tops. First Jackie Cole Second Ken Cole Third Robin Ives Highly Commended Bill Richmond. Glass. First Jeff Sanderson, Second Wayne Davey, Third Andrew Biglin Highly Commended Robin Ives. Still Life. First Peter Grigsby Second Bill Richmond. Own Choice. First Wayne Davey, Second Lesley Chalmers Third Robin Ives Highly Commended Andrew Biglin and Jeff Sanderson. Photo Montage First Lesley Chalmers, Second Bill Richmond. Local Photo. First Wayne Davey, Second Andrew Biglin, Third Bill Richmond Highly Commended Jackie Cole. The 2016 show, the 26th, was held at the John Green Institute in Belton on Sunday July 3rd . One of the main successes of this years event was the involvement with Moorlands Primary Academy who supported the show with a massive 225 entries leading to a total of 522, certainly a record by over 100, there were also entries from Belton Cubs and Scouts and Belton St. John Ambulance Badgers. 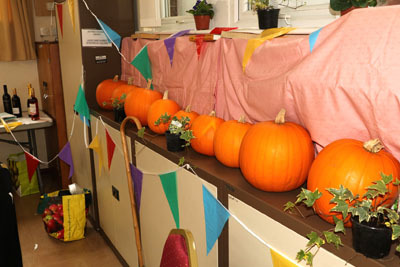 Overall the adult entries were however disappointing, whilst most sections kept to last years totals the weather put paid top almost all fruit and vegetable entries and for some reason the cooks were noticeable by their absence this year. The Bryan Cubitt Cup (Arts and crafts) went to Linda Bowman and the John Green Cup (Photography) to Wayne Davey. The Waveney Cup for young children’s entries went to Lewis Buckworth, The Gunstone Shield (for children aged 7-10) to Liam Walsh-Smith and the Carver Shield (Young People) to Faith Willeiard. Mixed Garden Flowers 1st. Sue Stone, 2nd. Gloria Swan, 3rd. Elaine White. H.T. Rose 1st. Christine Morden, 2nd. Emma Stone, 3rd Bill Richmond. Floribunda Rose 1st. Bill Richmond. Sweet Peas 1st. Christine Morden,2nd. Emma Stone. Assorted Foliage 1st. S Bridges, 2nd. John Gown, 3rd. Bill Richmond. Flower Arrangement 1st. Laurel Shepherd, 2nd Ann Andrews, 3rd. Heather Andrews. Fuchsia 1st. Peter Grigsby, 2nd. Brian Swan, 3rd. Ray Stone. Geranium 1st. Ray Stone, 2nd. Gloria Swan, 3rd. Sue Stone. Flowering Pot Plant. 1st. Sylvia Shaw, 2nd Jackie Cole. Foliage Pot Plant. 1st. Sylvia Shaw, 2nd. Brian Swan, 3rd. Elaine White. Cacti/Succulent 1st. Elaine White, 2nd. Lesley Chalmers. Container of annuals 1st. Bill Richmond, 2nd. Gloria Swan, 3rd. Elaine White. Broad Beans 1st. Peter Grigsby, 2nd. Christine Morden. Cucumber 1st. Wendy Griffiths. Lettuce 1st. Brian Swan, 2nd. Annette Carter. Strawberries 1st. Elaine White, 2nd. John White, 3rd. Bill Richmond. Raspberries 1st. Christine Morden, 2nd Elaine White. Soft Fruit 1st. Elaine White. Rhubarb 1st. Christine Morden, 2nd. Elaine White, 3rd. John White. Fruit Cake 1st. Sue Stone, 2nd Gloria Swan. Victoria Sandwich 1st. Sue Stone, 2nd Emma Stone, 3rd. Ian Walpole. Cup Cakes 1st. Wendy Griffiths, 2nd. Emma Stone, 3rd. Gloria Swan. Cheese Scones 1st. Sue Stone, 2nd. Jane Mill, 3rd. Gloria Swan. Jam 1st. Ann Andrews, 2nd. Gloria Swan, 3rd. Heather Andrews. Lemon Curd 1st. Ann Andrews, 2nd Ann Andrews. Marmalade 1st. Sylvia Shaw, 2nd. Rose Bishop. Chutney 1st. Janet Farrow, 2nd. Carole Hollis. WINE :- 1st. John White, 2nd. Elaine White. Watercolour Landscape 3rd. Jan Pitchers. Watercolour 1st. Edward Warner, 2nd. Patricia Morgan, 3rd. Emily Bradford. Oil/Acrylic 1st. Patricia Morgan, 2nd. Ben Burgess, 3rd. Heather Andrews. Pastel 1st. Patricia Morgan, 2nd. Emily Bradford, 3rd. Ashley Liffen. Pen & Ink 1st. Jan Warner, 2nd. Maureen Jackman. Collage/Mixed media 1st. Ben Burgess, 2nd. Jan Pitchers, 3rd. Heather Andrews. Other Medium 1st. Ed Warner, 2nd. Ann Andrews, 3rd. Jan Warner. Cross stitch/Tapestry 1st. Jean Brown, 2nd. Lynda Bowman, 3rd. J Farrow. Knitting/Crochet 1st. Elaine White, 2nd. S Bridges, 3rd. Sylvia Shaw. Embroidery/Patchwork 1st. Elaine White, 2nd. Ann Andrews, 3rd. Lynda Bowman. Greetings card. 1st. Linda Bowman, 2nd. Sue Richmond, 3rd Lesley Chalmers. Woodwork/Metalwork 1st. John Bridges, 2nd R Farrow, 3rd. Lucy Gill. Other Crafts 1st. Linda Bowman, 2nd. Ann Andrews, 3rd. Ken Cole. Shoes 1st. Wayne Davey, 2nd. Lynn Drewfitt, 3rd. Lesley Chalmers. Shadows 1st. Wayne Davey, 2nd. Peter Grigsby, 3rd. Michael Howell. Wild flowers 1st. Ken Cole, 2nd. Jean Brown, 3rd. Michael Howell. People on holiday 1st. Bill Richmond, 2nd David Rye, 3rd. Lesley Chalmers. Gates 1st. Lesley Chalmers, 2nd. Michael Howell, 3rd. Lynn Drewfitt. Sunrise 1st. Michael Howell, 2nd Lesley Chalmers, 3rd. D Burrage. Rubbish 1st. Barry Manthorpe, 2nd. Michael Howell, 3rd. Bill Richmond. Free Choice 1st. Peter Grigsby, 2nd. Heather Andrews, 3rd. D Burrage. Local photo 1st. Bill Richmond, 2nd. Michael Howell, 3rd. Jackie Cole. Painting of Space 1st. Lewis Buckworth, 2nd. Maxx Rix, 3rd. Liam Drane. Model of Space travel 1st. Sophie Long, 2nd Evie Humphreys, 3rd. Molly Carway. Miscellaneous item 1st. Lexi Driver, 2nd. Joey Taylor, 3rd. Bennington. Poem Space Travel 1st. Maddox Staff, 2nd. Jessica Bland, 3rd. Erin Woolbright. Model of Space travel 1st. Sam Bradford, 2nd. Sebastian Thomas, 3rd. Anna Eastwood. Miscellaneous item 1st. Liam Walsh-Smith, 2nd. Maddison Scally & Isobel Ward, 3rd. Lauren Ward. 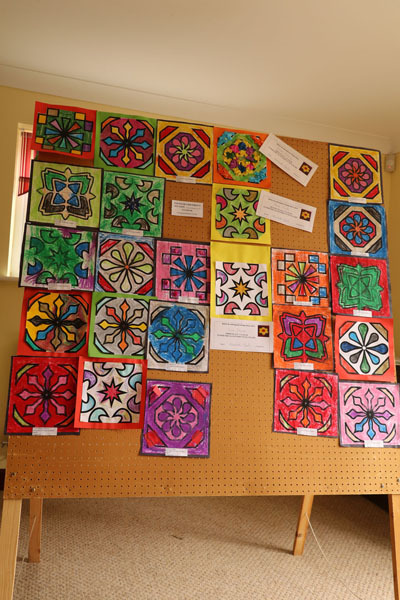 AGE 11 – 15 Art or Craft item 1st. Emily Bradford, 2nd. Natasha Pearson-Guklmane, 3rd. Dylan Riches. Most of the cups and trophies were presented by Kevin Lee, headmaster of Moorlands Primary Academy, whilst Faye Green, presented the John Green cup on behalf of the Green family. 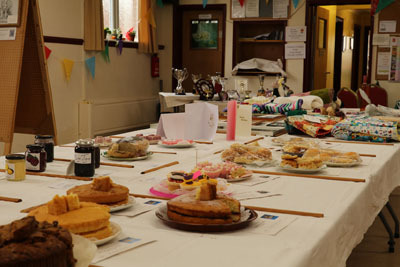 The committee would like to thank everyone who supported the event including those who donated raffle prizes and the judges, Ray Johnson (Gardening), Angela Townson (Home baking), Maggi Sadullah (Art), Dianne Goldspink (Crafts) and Michael Graystone (Photography). The show was slightly earlier than usual this year and that coupled with a cold Spring led to a decline in produce entries although flower class entries held up however there was also a reduction in the photographic entries. Any disappointment in adult entries was compensated by a large increase in childrens entries, special thanks to Moorlands Primary Academy for theirs along with Belton Scouts and cubs and the Belton St. John Ambulance badgers group, with these increases the total was almost identical to last year and the quality was the usual high standard that we have come to expect over the years. There was a large raffle, thanks to everyone who donated prizes including Tesco Belton, Reveal at Bradwell and Fritton Nurseries, thanks also to everyone who turned out to view on Sunday afternoon, the hall was absolutely packed. At the end of the viewing Belton’s Rector, The Rev Rosie Bunn presented most cups and trophies while Mary Cubitt presented the Bryan Cubitt Cup and Faye Green the John Green Memorial Cup. 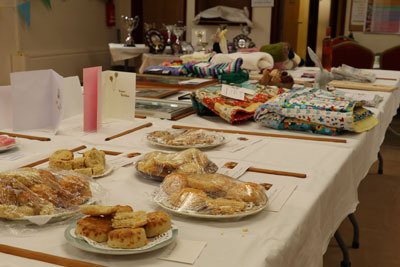 Thank you to all who took part or attended and to the show committee, the W.I helpers in the kitchen, the judges as well as the JGI Trustees for their continued support of the event. Vase of Annuals – 1st. Bill Richmond. 2nd Gloria Swan, 3rd. Sue Stone. Hardy Perennials – 1st. Gloria Swan, 2nd. Rosie Bunn, 3rd Sylvia Shaw. HT Rose – 1st. Emma Stone, 2nd. Bill Richmond, 3rd.Shirley Hume. Floribunda Rose – 1st. Sue Stone, 2nd. Margaret Mc. Kim, 3rd Maureen Boreham. Sweet Peas – 1st. Tony Knight, 2nd. Gloria Swan. Assorted Foliage – 1st. Bill Richmond, 2nd. Gloria Swan, 3rd. Maureen Boreham. Flower Arrangement – 1st. Pat Whall, 2nd. Heather Andrews, 3rd. Ann Andrews. Fuchsia – 1st. Sylvia Shaw, 2nd. Brian Swan, 3rd. Jackie Cole. Geranium – 1st. Brian Swan, 2nd. Jackie Cole. Flowering plant – 1st. Gloria Swan, 2nd. John Gill. Foliage plant – 1st. Sylvia Shaw, 2nd. Gloria Swan. Cacti/Succulent – 1st. Lesley Chalmers, 2nd Gloria Swan. Container of Annuals – 1st. Sylvia Shaw. Peas – 1st. Tim Bunn, 2nd. Andrew Willeard. Carrots – 1st. Andrew Willeard. Potatoes – 1st. Tim Bunn. Radishes – 1st. Andrew Willeard, 2nd. William Harding. Cucumber – 1st. Maureen Boreham. Lettuce – 1st. Bill Richmond. Strawberries – 1st. Andrew Willeard, 2nd. Brian Swan, 3rd. Sandra Bridges. Rhubarb – 1st. Andrew Willeard, 2nd. Brian Swan. Fruit Cake – 1st. Gloria Swan, 2nd. Lisa Willeard, 3rd. Sue Stone. Victoria Sandwich – 1st. Shirley Hume, 2nd. Emma Stone, 3rd. Victoria Bracewell. Cup Cakes – 1st. Ann Andrews, 2nd. Emma Stone, 3rd. Caroline Palmer. Cheese Scones – 1st. Victoria Bracewell, 2nd. Gloria Swan, 3rd. Lesley Chalmers. Savoury Quiche – 1st. Maureen Boreham. Fudge – 1st. Jackie Blyth, 2nd. Victoria Bracewell. Madeira Cake – 1st. Shirley Hume, 2nd. Wilma Fuller. Jam – 1st. Wendy Griffiths, 2nd. Gloria Swan, 3rd. Carole Hollis. Lemon Curd – 1st Heather Andrews, 2nd. Ann Andrews. Marmalade – 1st. Sylvia Shaw. Chutney – 1st. Wendy Griffiths, 2nd Carole Hollis. Any Type – 1st. Jack Fuller. Landscape watercolour – 1st. Edward Warner, 2nd Jane Mill, 3rd. Jackie Cole. Watercolour, any subject – 1st. Emily Bradford, 2nd Edward Warner, 3rd. Jane Mill. Oil/Acrylic – 1st. Pat Morgan, 2nd. Emily Bradford. Pen/Ink – 1st. Maureen Jackman. Art (any medium) – 1st. Ann Andrews, 2nd Ann Andrews, 3rd. Jan Warner. Cross stitch/Tapestry – 1st. Sylvia Shaw, 2nd. Jean Brown, 3rd. Hilda Beach. Knitting/crochet -1st. Carly Stroud, 2nd. Dorothy Knight, 3rd. Jean Brown. Embroidery/patchwork – 1st. Pat Whall, 2nd. -, 3rd. Ann Andrews. Greetings card – 1st. Sue Richmond, 2nd. Lesley Chalmers, 3rd. Heather Andrews. The Colour Blue – 1st. Bill Richmond, 2nd. Stan Daniel, 3rd. Jackie Cole. Song Title – 1st. Bill Richmond, 2nd. Ian Chalmers, 3rd. Lesley Chalmers. Childs Toy – 1st. Sylvia Shaw, 2nd. Bill Richmond, 3rd. Ann Andrews. Tree Trunk – 1st. Ken Cole, 2nd. Jackie Cole, 3rd. Barry Manthorpe. Montage – 1st. Bill Richmond, 2nd. Lesley Chalmers, 3rd. Heather Andrews. Painting (Nursery Rhyme) – 1st. Dylon Allan, 2nd. P. J. Blyth, 3rd. Ria Allan. A Model (Nursery Rhyme) – 1st. Alfie Cullum, 2nd. Bella Lawrence, 3rd. Lewis Eastwood. Other item – 1st. Bella Lawrence, 2nd. Isabella Brownlie, 3rd. Oliver Powell. Painting (Flying Machine) – 1st. Liam Walsh-Smith, 2nd. Gracie Jermy, 3rd. Mariey Driver. A Model (Flying Machine) – 1st. Charlie Groome, 2nd. Dylan Blower, 3rd. Luke Stroud. Other item – 1st. Anna Eastwood, 2nd. Scarlet Griffiths, 3rd. Toby Chamberlin. Art or craft item – 1st. Emily Bradford, 2nd. Freya Johnson, 3rd. Dalton Blyth. Free choice photo – 1st. Dalton Blyth. Bryan Cubitt Cup (Best arts & crafts as voted by public) – Jean Brown, John Green Cup (Best in Photography as voted by public) – Wayne Davey. 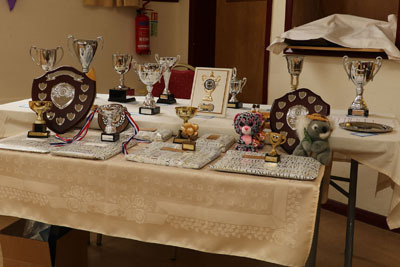 The Waveney Cup (Best entry ages to 6 years ) – Alfie Cullum, Gunstone Shield (Best in show ages 7 – 10) – Anna Eastwood, Carver Shield (Best in show ages 11 -15) – Emily Bradford. This years judges were Gardening – Ray Johnson, Home Baking – Angela Townson, Art – John English, Photography – Bill Goodchild and Crafts – Diane Goldspink. Councillor Marlene Fairhead and her husband. The weather was not kind to gardeners this year with all associated classes being down in entries. were very much in line with normal except for a drop in children’s entries, overall 40 down on last year but still an excellent quality all round. There was a large raffle, one of the best ever, thanks to everyone who donated prizes including The Hole Plaice, Tesco Belton and Fritton Nurseries. Thanks also to everyone who turned out to view on Sunday afternoon, many getting absolutely soaked due the very sharp downpours. Vase of Annuals – 1st. Bill Richmond. Hardy Perennials – 1st. Elaine White, 2nd. Bill Richmond, 3rd Gloria Swan. HT Rose – 1st. Emma Stone, 2nd. Sue Stone, 3rd.Dorothy Knight. Floribunda Rose – 1st. Bill Richmond, 2nd. Maureen Boreham. Sweet Peas – 1st. Emma Stone, 2nd. Gloria Swan, 3rd. Jane Clark. Assorted Foliage – 1st. Margaret Dunsford, 2nd. Gloria Swan, 3rd. Bill Richmond. Dahlias- 1st. Bill Richmond, 2nd. Emma Stone. Flower Arrangement – 1st. Ann Andrews, 2nd. Margaret Dunsford, 3rd. Sylvia Shaw. Fuchsia – 1st. Pete Grigsby, 2nd. Elaine White, 3rd. Brian Swan. Geranium – 1st. Ray Stone. Flowering plant – 1st. Brian Swan, 2nd. Sue Stone.3rd. Ann Coward. Foliage plant – 1st. Sylvia Shaw, 2nd. Brian Swan. 3rd. Bill Richmond. Cacti/Succulent – 1st. Brian Swan. Broad Beans – 2nd. Ann Coward. Peas – 1st. Jane Clark, 2nd. Brian Swan, 3rd. Elaine White. Carrots – 1st. Ria Allen. Potatoes – 1st. Ria Allen, 2nd. Tim Bunn , 3rd. Ann Coward. Radishes – 1st. Peter Morden. Cucumber – 1st. Ray Stone, 2nd. Marureen Boreham. Lettuce – 1st. Jane Clark, 2nd. Maureen Boreham. Runner Beans – 1st. Ann Coward. Strawberries – 1st. Elaine White. Raspberries – 1st. Christine Morden, 2nd. Elaine White. Other soft fruit – 1st. Christine Morden, 2nd. Dorothy Knight, 3rd. Elaine White. Rhubarb – 1st. Patricia |Morgan, 2nd. Brian Swan, 3rd. Peter Morden. Fruit Cake – 1st. Maureen Boreham, 2nd. Gloria Swan, 3rd. Wilma Fuller. Victoria Sandwich – 1st. Wilma Fuller, 2nd. Shirley Hume, 3rd. Jackie Blyth. Cup Cakes – 1st. Sharon Hollise, 2nd. Emma Stone, 3rd. Victoria Bracewell. Cheese Scones – 1st. Wendy Griffiths, 2nd. Mrs G Brooks, 3rd. Dorothy Knight. Savoury Quiche – 2nd. Maureen Boreham, 3rd. Christine Morden. U.S. Cookies – 2nd. Jackie Blyth, 3rd . Caroline Palmer. Bread -1st. Leslie Chalmers. 2nd. Victoria Bracewell, 3rd. Jack Fuller. Fudge – 1st. Wilma Fuller, 2nd. Patricia Morgan. Madeira Cake – 1st. Victoria Bracewell. Jam – 1st. H Beach, 2nd. Dorothy Knight, 3rd. Carole Hollis. Lemon Curd – 1st. Jack Fuller, 2nd. Heather Andrews. 3rd. Ann Andrews. Marmalade – 1st. H Beach. 2nd. Sylvia Shaw. Chutney – 1st. Heather Andrews, 2nd Ann Andews. Any Type – 1st. Elaine White, 2nd. Jack Fuller, 3rd. Malcolm Potter. Landscape watercolour – 1st. Edward Warner, 2nd Elaine White, 3rd. Jackie Cole. Watercolour, any subject – 1st. Pauline Parkinson, 2nd Edward Warner, 3rd. Jane Mill. Oil/Acrylic – 1st. Elaine White, 2nd. Maureen Jackman, 3rd. Pauline Parkinson. Pen/Ink – 1st. Maureen Jackman, 2nd. Jackie Blyth, 3rd. Jan Pitchers. Collage/ Mixed media -1st. Jan Pitchers, 2nd. Jan Warner. 3rd. Heather Andrews. Art (any medium) – 1st. Ken Cole, 2nd. Ann Andrews..
Cross stitch/Tapestry – 1st. Heather Andrews, 2nd. Sylvia Shaw, 3rd. Ann Andrews. Knitting/crochet -1st. Sue Stone, 2nd. Dorothy Knight, 3rd. Sylvia Shaw. Embroidery/patchwork – 1st. Ann Sanderson, 2nd. Ann Coward, 3rd. Ann Andrews. Greetings card – 1st. Sue Richmond, 2nd. Ann Andrews, 3rd. Heather Andrews. Woodcraft/metalwork – 1st. Stephen Kettle, 2nd. Adam Thistlewaite 3rd. Ann Andrews/Heather Andrews. Other craft – 1st. Heather Andrews, 2nd. Ann Andrews. Stained Glass – 1st. Bill Richmond, 2nd. Geoff Sanderson, 3rd. Jackie Cole. Two Wheels – 1st. Bill Richmond, 2nd. M Howell, 3rd. David Rye. Water – 1st. David Rye, 2nd. Sue Kettle, 3rd. M Howell. Natures Own Frame – 1st. Stan Daniel, 2nd. Lesley Chalmers, 3rd. Bill Richmond. Montage – 1st. Lesley Harper, 2nd. Lesley Chalmer, 3rd. Daniel Thistlewaite. Photo of local villages -1st. Lesley Chalmers, 2nd. Bill Richmond, 3rd.M Howell. Painting (Monster) – 1st. Pamela Joy Blyth, 2nd. Lewis Eastwood. A Model (Monster) – 1st. Toby Goldsmith, 2nd. Ria Allen, 3rd. Pamela Joy Blyth. Other item – 1st. Ria Allen, 2nd. Lewis Eastwood. Painting (Monster)- 1st. Gracie Dean, 2nd. Olivea Rolfe, 3rd. Anna Eastwood. A Model (Monster) – 1st. Scarlet Griffiths, 2nd. Ellie Thrower, 3rd. Jamie Hogan. Other item – 1st. Anna Eastwood. Art or craft item – 1st. Luchia Blyth, 2nd. Dalton Blyth. Free choice photo – 1st. Luchia Blyth, 2nd. Dalton Blyth. Bryan Cubitt Cup (Best arts & crafts as voted by public) – Stephen Kettle, John Green Cup (Best in Photography as voted by public) – Jeff Sanderson. Carver Shield (Best in show ages 11 -15) – Luchia Blyth. continued, thank you to Moorlands School and Belton Scouts for your support. presentation to show treasurer Claire Watts who is leaving the village for a new life in Yorkshire.